"Before the end of the decade, all Volvo models will have engines with no more than four cylinders," Volvo r&d boss Peter Mertens told Automotive News Europe. Starting in 2013, a new family of three- and four-cylinder gasoline and diesel engines will replace the carmaker's five- and six-cylinder gasoline engines, as well as its five-cylinder diesel. The first application of the VEA (short for Volvo Environmental Architecture) engine will most likely appear in 2013 in one of Volvo's existing models, Mertens said in an interview at the auto show here last week. The VEA family will include four engines: 1.5-liter three-cylinder gasoline direct-injection and diesel engines as well as 2.0-liter four-cylinder gasoline direct-injection and diesel engines. 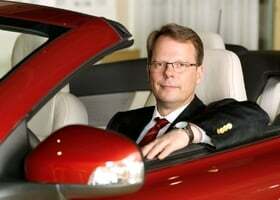 Volvo will develop four-cylinder engines with higher performance than today's six-cylinder units, says Peter Mertens. Volvo is likely to sell more than 400,000 cars this year, and may reach 430,000, up from 373,525 last year, CEO Stefan Jacoby said. Ford Motor Co. last year sold Volvo to Chinese automaker Zhejiang Geely for about $1.5 billion. The VEA engine is one of Volvo's efforts to achieve economies of scale within the company's own model range. Another is its new so-called SPA (scalable platform architecture) vehicle platform. "SPA will allow 80 percent of Volvo models to be built on the same production line irrespective of vehicle size and complexity," Jacoby said. Mertens said: "We're taking our technological future into our own hands. Both our new architecture and the new engine range will enable us to be on par or even beat our toughest competitors in crucial areas such as driving dynamics and fuel economy." The first car to be underpinned by the SPA architecture is likely to be a large sedan due in 2014 to replace the S80. The design of this future model previewed by the You concept unveiled at the Frankfurt auto show last week. Later this year, Volvo will begin to test the potential of flywheel drive on public roads. The so-called KERS (Kinetic Energy Recovery System) captures braking energy in a flywheel that spins at up to 60,000 rpm. Once released, this stored energy can either accelerate the car or propel the vehicle once it reaches cruising speed. "The flywheel system offers the driver an additional 80 horsepower while reducing fuel consumption by up to 20 percent," Mertens said. KERS systems based on a flywheel were tested in Formula One racing in recent years. The system was eventually replaced when race teams opted for a design similar to that found in gasoline hybrid models, where the energy recuperated while braking is stored in a battery and then released to an electric motor.